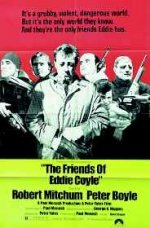 Robert Mitchum appears in an unfamiliar role, playing an ageing small-time gangster and cynical police informer who is relentlessly pursued by the mobsters he has betrayed. In a quality cast, Peter Boyle stands out as the hit man and so-called friend who's given the job of eliminating Mitchum. Peter Yates, the British director who forged his Hollywood reputation with the incredible car chase in the Oscar-winning Bullitt, gives this crime drama a more subtle tone, turning the story into a fable about urban violence. This was an important performance by Mitchum in terms of his career, with his subsequent characters often displaying the same distinctive world-weary outlook on life.